Wisconsin Gov. Scott Walker announced Monday evening that he is dropping out of the presidential race so that voters can focus on finding an alternative to the Republican frontrunner -- businessman Donald Trump. "Today I believe that I am being called to lead by helping to clear the field in this race so that a positive conservative message can rise to the top of the field. With this in mind I will suspend my campaign immediately," Walker said at a news conference in Madison, Wisconsin. "I encourage other Republican presidential candidates to consider doing the same so that the voters can focus on a limited number of candidates who can offer a positive, conservative alternative to the current frontrunner. This is fundamentally important to the future of the party and more important to the future of our country." After describing the Republican debate in Simi Valley last week, Walker said, "the debate taking place in the Republican Party today is not focused on that optimistic view of America. Instead it has drifted into personal attacks. In the end, I believe the voters want to be for something and not against someone." 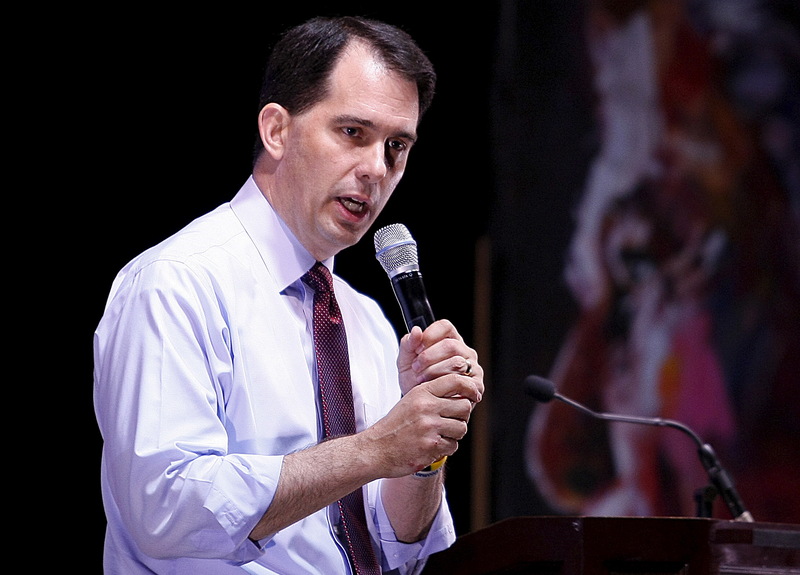 The move to pull out out of the race surprised close Walker supporters. Some had advocated for a big staff shakeup but there was little suggestion donors were preparing to abandon the cause entirely. As recently as Thursday, Walker spoke optimistically with his donors about the campaign's prospects in Iowa, where he believed they had lost momentum but remained competitive. And Walker's super PAC still had about $25 million in the bank to help sway voters. One source very close to Walker's camp told CBS News the decision to suspend the campaign "took major donors by surprise." Walker was one of the last Republicans to enter the race, announcing his campaign in mid July, after Wisconsin's budget had been signed. At the time, Walker promised that his record in the state - stripping away union power, lowering taxes, passing pro-life legislation and more - showed that he knew how to "fight and win for America." In January, before entering the presidential race, he looked like he could be a serious competitor in Iowa, where voters hold the first nominating contest of the primary election cycle. Republican operatives in the state were impressed with the way he fired up the state's grassroots social conservative activists at the Iowa Freedom Summit. But after he entered the race, his poll numbers began to drop, and mediocre performances in the GOP debates failed to impress his backers. In a CNN/ORC poll released over the weekend, following the second debate in Simi Valley, California, Walker showed the most precipitous drop. He was part of a group of five candidates that received less than one half of 1 percentage point support. The Walker campaign reviewed internal polling data that also had bad news - it tracked with the CNN poll and showed the same dramatic fall. As recently as early August, Walker was sitting in second or third place in the polls behind former Florida Gov. Jeb Bush and Trump. I got to know @ScottWalker well-he's a very nice person and has a great future. A staff call for all Walker staff is scheduled before the press conference, the first widespread notice of the decision after a weekend of closely held conversations. Walker had an estimated 90 to 100 paid staffers, which, in the eyes of some donors, was too expensive for a campaign that needed to reach and motivate Republicans in Iowa, rather than carrying out the campaign in Madison, Wisconsin. Walker had been reluctant to lay off staff, fearing it would generate a cascade of negative publicity and drive away restive donors, Garrett reported. One Republican strategist argued that Walker made the classic mistake of growing his staff too quickly during his brief stint at the top of the polls - creating a "big fearsome campaign organization" that was meant to scare off the other candidates but in fact sealed his own demise, CBS News Correspondent Nancy Cordes reported. Once his poll numbers dropped and donations fell off, Walker couldn't afford to pay staff and knew that staying in the race but laying people off would lead to a raft of negative stories that hurt him even more. If he had a smaller campaign team, he might have been able to regroup and campaign on a shoestring for a while, until GOP voters grew disenchanted with other frontrunners like Trump, neurosurgeon Ben Carson and former Hewlett Packard CEO Carly Fiorina. Some Republicans, though, are already drawing parallels to former Minnesota Gov. Tim Pawlenty, who dropped out of the 2012 presidential race after a poor showing at the Iowa Straw Poll in August 2011. Many believed his exit was premature, as they watched a series of other longshot GOP candidates like former Minnesota Rep. Michele Bachmann and businessman Herman Cain experience brief spikes in support before flaming out. Similarly, some GOP donors thought Walker could ride out this very rough patch, put together a better national team and turn things around in Iowa. Walker decided differently.